There’s nothing more cozy that a simple bowl of Pasta with Roasted Veggies. 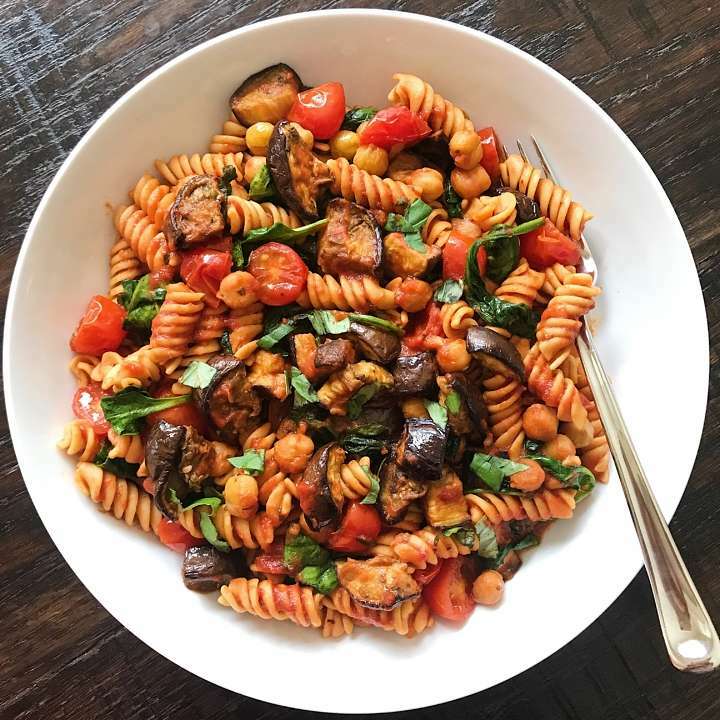 And this dish is packed with some of our favorites: Roasted eggplant, roasted chickpeas, sautéed tomatoes and spinach all mixed with a fresh tomato sauce and Banza chickpea rotini, then topped with fresh basil. It seems like a lot but it actually comes together quite quickly. I roasted the eggplant and chickpeas ahead of time. Then when ready to eat, I sautéed the tomatoes and spinach while the pasta cooked. I added in some homemade tomato sauce (we had some Simple Tomato Sauce in the fridge but easy to make or use a store-bought one), added the pasta, eggplant, chickpeas and cooked an additional minute or two, then served and topped with basil. If you eat dairy, this dish goes well with ricotta salata or a spoonful of ricotta the way my son likes it. A hearty and melt-in-your-mouth delicious gluten-free, vegetarian pasta dish. Roasted eggplant, roasted chickpeas, sautéed tomatoes and spinach mixed with fresh tomato sauce (use homemade or store-bought) and gluten-free pasta, and topped with fresh basil. Can be partially made ahead and comes together quickly when ready to eat. Olive oil - approximately 5 tbsp divided. NOTE: the eggplant and chickpeas can be prepped ahead of time. Drizzle Chickpeas with olive oil, salt & pepper. Place on a baking sheet & roast at for approx 15 minutes or until just crunchy. Place aside. Meanwhile, cut Eggplant into ½ inch cubes and place in a strainer. Sprinkle with salt and let sit for at least 20 minutes*. (This removes some water and takes away any bitterness). *Note: I've skipped this step when short on time and it's still good. Toss eggplant in olive oil, salt & pepper to taste and bake at 400° for approx 30-45 minutes or until tender. Place aside. When ready to eat, prep pasta according to package till al dente. While pasta cooks, heat 1-2 tbsp olive oil in a large sauce pan. Add garlic and cook about 1 minute or until just fragrant. Add in tomatoes and cook for about 5 minutes or until starting to soften and blister. Add in Spinach and cook approximately 5 minutes or until starting to wilt. Add pasta, roasted eggplant, chickpeas, and tomato sauce (start with 1 cup sauce and add more as desired) to the pan with spinach and tomatoes. Stir and combine gently, heat for another minute or until eggplant warm. Serve and top with fresh basil. If not dairy free, also pairs well with ricotta salata, a spoonful of ricotta or parmigiana reggiano cheese. Hi, this looks so good and I can’t wait to try it!! I was just curious how much pasta you used since I’m using from a bulk bag. Also, about how many servings would you say this recipe makes? Thanks! Thanks so much Allyson! And great questions! The sauce should be enough for 4 people. You can always add more tomato sauce to make it go farther. Regarding the pasts, one box of Banza is 8oz. One box of Barilla is 12oz. In my house, making a box usually feeds 3 of us (I’m feeding big pasta eaters), so I usually add a bit more if feeding 4. Let me know if you make it and how you like it! Just made it for the second time tonight! Love this recipe!! SO happy you love it as much as we do! Thanks for sharing!